In searching for cookies to whip up during our annual holiday baking madness, I came across these. And knowing that a couple of my coworkers liked caramel combined with the fact that salted caramel has been an IT thing for a couple of years, I figured we had to make them. Not being a big caramel fan myself, I wasn't planning on falling in love with them, but the salty sweet combo did me in. 1. Since we were doing holiday baking, we made a quadruple batch and ended up with 55 cookies (about 14 per batch), though some were a bit large. The original recipe says you should get 16 per batch. I say better to up the recipe if you aren't sure, since these make for delicious extras. 2. The dough was a bit crumbly, which made it hard to work with. 3. The cookies did not hold the thumbprints well. We found that ~50% held their shape, ~25% kind of held a hint of a well, and ~25% went totally flat. Chilling the cookies again after shaping the wells helped a little, but did not solve the problem completely. I did not have luck pressing the wells back in just after removing them from the oven. Some other bakers suggested doing so part way through the baking time, and I may try that the next time we make them. 4. The caramel was Amazing. Hands down the best caramel I've ever had (major props to the hubby who made the caramel). There was also a LOT of it. 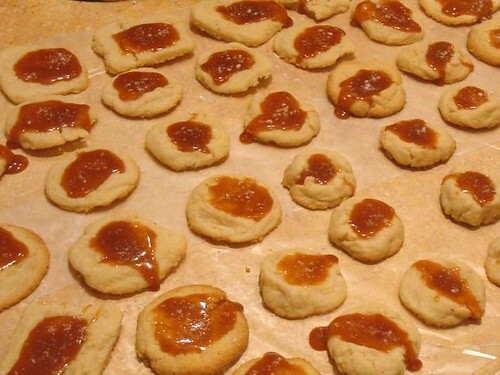 Since we quadrupled the cookie recipe, we also quadrupled the caramel recipe. Even after very generous amounts were given to the cookies, we still ended up with about a pint of caramel left over (think two jelly jars). Based on that, I would suggest halving the amounts given above. Or, do what we did and jar it. This site indicates that it should last 1-3 months depending on how you store it. 5. The flavor combination was Amazing. The crumbly shortbready cookie, the soft sweet caramel, the touch of salt sprinkled on top...poetry in cookie form.